Fleetwood Town chairman Andy Pilley says any club would be lucky to have the departing John Sheridan at the helm. 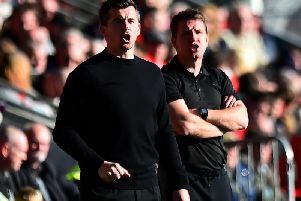 Having taken the decision to appoint Joey Barton as the club’s new head coach from June, Pilley has praised the work done by Sheridan, who replaced Uwe Rosler earlier this year. He came into a club that was on an eight-match losing run and turned the squad into one that remembered how to win football matches. Two defeats in his 11 games in charge duly secured Town’s status as a League One club and the chairman’s gratitude. Pilley now fully expects to see Sheridan in charge of another club next season. He said of Sheridan: “What a fantastic professional; not just a good professional guy but a hell of a manager, he really is. “The turnaround that he has achieved for this club has been extraordinary. “It will be some lucky football club out there who gets him as their manager. “They will be really fortunate because his man management skills are exceptional and he has been so professional about the whole situation. “I cannot praise him enough. I would be amazed if somebody did not take him. “He is absolutely first class and there will always be clubs that need managers. “I’m sure lots of clubs will be noting how well he has done and be fully aware of his points tally – and how he has turned a club around that was going somewhat backwards. As for Sheridan, he unsurprisingly wants to get back into management as soon as possible. His short-term contract at Highbury ends after Town’s final game of the season when they host Walsall on May 5. He said: “I want to get a job as quickly as I can. “I’ve come and done what I have had to do. I had a belief in myself that I could do it, the chairman gave me the chance and I have done it. “I’m always a big believer in what will be will be. “If someone fancies giving me a job then I will be interested in getting a job, but at this moment in time, I’ve got three or so weeks left here. “I’m just going to give 100 per cent focus on getting as high as I can up the table. “But I want to be involved in football and I will let other people say how good a job I’ve done; I won’t be shouting it.